The 2018 WNBA Draft took place last night at Nike’s New York headquarters and Wasserman clients stole the show. 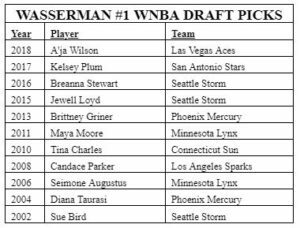 A’ja Wilson, selected 1st overall by the Las Vegas Aces, and Gabby Williams, selected 4th overall by the Chicago Sky, are both Wasserman clients represented by Senior Vice President, Women and Olympics Lindsay Kagawa Colas. 11 of the past 17 first overall picks have been represented by Wasserman. Not only does Wasserman represent two of the top four picks in the draft, but it marks the fourth straight year where the agency represents the 1st overall pick. Wilson was the first three-time SEC Player of the Year as well as a two-time SEC Defensive Player of the Year at South Carolina. She led the Gamecocks to the 2017 NCAA National Championship and had an accolade-ridden career in Columbia. She was a four-time All-American, a four-time All-SEC First Team selection and brought home all of the 2018 player of the year awards, including: The John R. Wooden Award, Associated Press National Player of the Year, Naismith College Player of the Year, Wade Trophy (NCAA Division I Player of the Year), and Lisa Leslie Award (nation’s best center). Williams had a highly successful career herself as a member of the storied UConn Huskies women’s basketball program. A two-time national champion (2015, 16), she won the Cheryl Miller Award as the nation’s best small forward in 2018. She was also an All-America Second Team member, All-AAC First Team and a semifinalist for both the Wooden and Naismith awards. Not wasting any time, Wilson launched a campaign to benefit programs and services at the Palmetto Health Children’s Hospital Center for Cancer and Blood Disorders in her hometown of Columbia, SC. The 2018 WNBA season tips off on May 18.